Portland, Oregon – Thursday, July 29th, 1965. I first read about an apparent appearance by Louis Armstrong at the Lloyd Centre shopping mall some time ago where a first hand account was given by someone who stated the occasion had been the very opening of the mall (1960). I then read somewhere else that He had played from the ‘parking lot’. Hmm.. ok.. two different statements – gaining some traction here. Further research and investigation failed to establish a definite date, or any further substantial claims or eye witness accounts. Not that I needed ‘evidence’ to prove the event by this stage. It seemed fairly credible, but I was hungry for facts and details, preferably in that order. Then early in 2013, I stumbled across another witness to the event who I contacted in hope of the aforementioned facts and details. Well, as we say sometimes, I hit the motherload. Email after email flowed into my inbox, 26 at the final count! 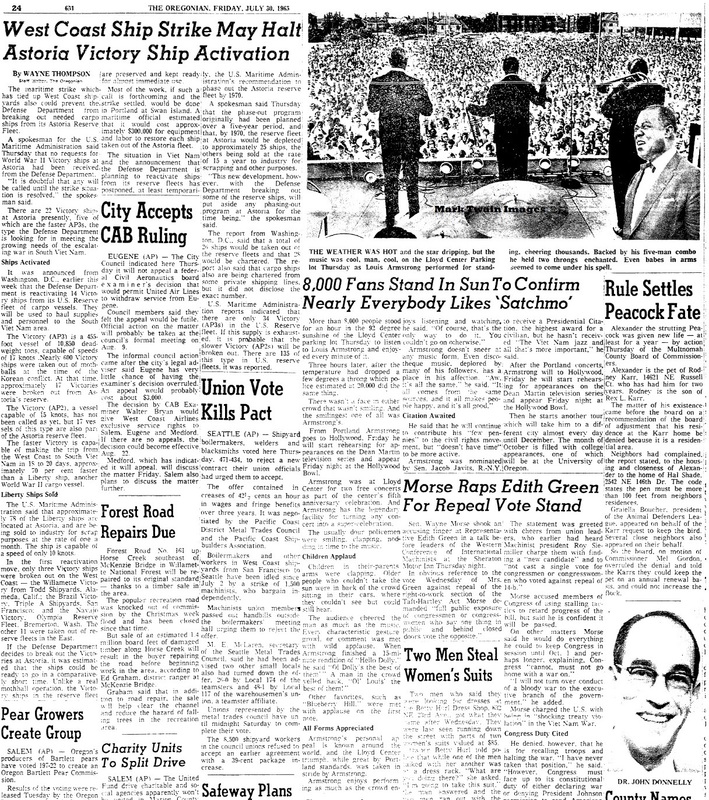 Here are the pictures and the original newspaper article from The Oregonian newspaper reporting on the landmark event. 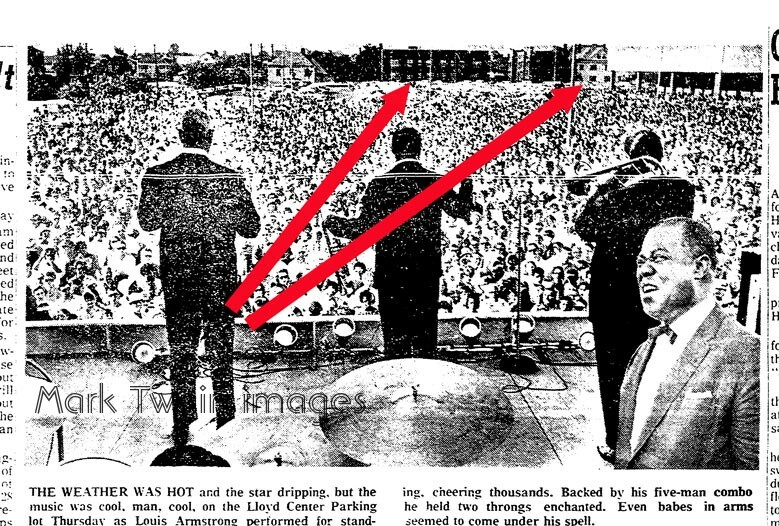 Two free concerts in one sweltering day at the Lloyd Centre in 1965 by Louis Armstrong and His band. Louis and His band played in front of a SEA of people (yeah a SEA, check out the picture of the crowd from the behind the musicians!). The article says the crowd swelled from a few thousand to 20,000. Does it look like more to you? The exact spot of the performance was smack in the middle of what is now Nordstrom’s second floor. It was from here, the second floor of the parking lot, that they performed facing north in the direction of NE Halsey. Hopefully the pictures add clarity to this. The people would have been spread all over the area up to Halsey at least. The above picture was taken in the summer of 1967 looking in a southeasterly direction. The point of the arrow marks the spot where the stage was, at the south end of the second level parking lot, and where the second floor of Nordstrom now is. The left arrow in the picture below points to the brick apartment building on the right of the two brick buildings at the bottom and middle of the picture above. The right arrow below points to the pale house to the left and just behind the other brick building at bottom middle in the above pic. This picture from behind the band is looking north – what a shot, by the way! It was uncredited even then but was probably taken by Oregonian photographer David Falconer. Selected comments from the article : ‘The usually dour policemen were smiling, clapping, nodding in time to the music’,’.. was at Lloyd Center for two free concerts as part of the center’s fifth anniversary celebration’. Well you really should read it for yourself. It was an unbridled success in blazing sunshine. It’s highly likely that Louis stopped in to visit on Portland Jazz pianist Sidney Porter’s club on NE Sandy after the second of the two concerts. Without further fanfare… here is the full article. Click for an enlarged view and easier to read experience. This entry was posted in Jazz Times and tagged Lloyd Centre, Louis Armstrong. Bookmark the permalink. I grew up in Portland. When I was 13 in 1960, my parents took me to the Loyd Center and I stood near the stage and heard Louis play. I remember being very close and for some reason don’t remember the crowd at all, but remember being awed that I was that close to such a great artist. It’s one of my fondest memories. Keep in close contact, Victor, something is afoot for the latter half of August (if you still live around these parts). Thanks for the uplifting wonderful story! I was on the upper parking lot in 1960 aug. I collected 2cent bottles for the 10cent bus fare aboard bluebird buses and because I had managed to find the fare my father let(no parent would ever do this now lol) me take the bus by myself to the brand new Lloyd center. I had just turned nine… I was three rows from the front as he played. There was no massive crowd, maybe seventy people… in the upper parking lot… those news paper photos are from the five year anniversary celebration! I made it home on the bus just before dark… I think my father was alternating between angry at how late it was and pride that I’d set a goal and accomplished it! Thank you for that! I was beginning to doubt my own memory. We probably saw each other.